This time of year, the weather is hot and humid. To avoid the extreme temperatures, many people turn to their AC units for cool relief. In fact, there is no better way to enjoy summer than from the comfortable coolness of your house. However, running your AC on full blast means it’s more susceptible to problematic breakdowns. One effective way to avoid AC breakdowns is to schedule regular seasonal maintenance. At Aspire Heating & Cooling, AC home repair is their specialty. With extensive knowledge of AC systems and professionalism for every home repair, they’re the experts you can trust. With regular seasonal checkups, you decrease your chances of an AC breakdown, since your system is regularly inspected for issues. In addition, Aspire’s professional service will also greatly increase your AC unit’s lifespan, reliability, and your total operating cost. While malfunctions are bound to happen, let Aspire’s experts catch them before they do. Finally, they back every repair by their 100% Guarantee. Thus, you’ll be completely satisfied with their service. Aspire’s experts are regularly trained and updated. Therefore, they are familiar with every make, model and problem that might arise with AC units. Additionally, they use state-of-the-art technology and have a full inventory of replacement parts. When you call them, they’ll inspect your unit, diagnose the problem and then fix it. Hence, your issue is resolved as quickly as possible and you can get back to enjoying your cool air. Lastly, their overtime service allows anyone to call and get fast and professional after-hours service. So, whenever your AC system breaks, they’re ready to help you. Experiencing A Problem with Your AC? 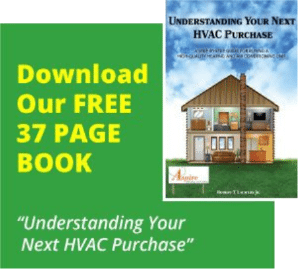 Are you experiencing a problem with your AC? It may be something you can fix yourself. For AC problems, there are four things you can try. First, is your fan set to “On” rather than “Auto?” A quick check of the thermostat will tell you the setting. Second, are your AC unit’s lines frozen? This may seem odd since it’s hot outside, but frozen lines on an air conditioner is not uncommon. For this problem, make sure there is no blockage on air entrance points, as reduced air flow causes freezing. Next, check the system for closed vents or anything else that may be obstructing the return vent. If you can’t find the source of the problem, get professional assistance. Third, is your AC unit’s air filter dirty with grass, dust or dirt? A dirty air filter prevents the proper air flow through your AC, which can stop temperature regulation. The simple solution is to change your air filter. Fourth and finally, your actual AC unit might be dirty or clogged with dirt, dust or grass. Try cleaning your system and if this still doesn’t work, you need professional AC home repair from Aspire.